Daikokuten	is generally famous as a god of luck. He is most familiar in Japan as a fat, smiling figure with a big sack over his left shoulder and a mallet in his right hand, standing on bales tawara 俵 full of rice. He was particularly popular in the Edo period, as one of the seven gods of good fortune *shichifukujin 七福神. However, in India he was a warrior deity called Mahakala and was considered an emanation of Siva. In texts his name was transliterated as Makakara 摩訶迦羅 and translated as Daikokuten in the DAIHOUDOUDAIJIKKYOU 大方等大集経, translated in the Sui dynasty. In Japan he appears in the outer court of the *Taizoukai mandara 胎蔵界曼荼羅 ; Gekongoubu-in 外金剛部院 as a three faced, six-armed seated deity. According to the DAINICHIKYOUSHOU 大日経疏, *Dainichi 大日 appear as Daikokuten in order to subdue Dakiniten 荼吉尼天. However, there are no independent images of Daikokuten in Japan that resemble the one in the Taizoukai mandara. 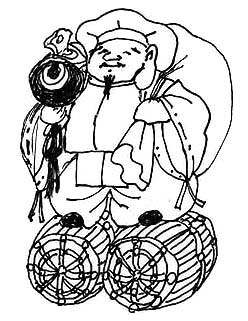 It appears that Daikokuten came to be a protector of food supply because images of him were placed in monastery kitchens in India and in China. In Japan this practice is said to have been begun by Saichou 最澄 (767-822) on Mt. Hiei 比叡. The oldest extant image of Daikokuten in Japan is the late Heian wooden sculpture in Kanzeonji 観世音寺 in Fukuoka prefecture. In this, his expression is fierce. In the sculpture of Myoujuin 明寿院 of Kongourinji 金剛輪寺 (Shiga prefecture; late Heian period) he is shown in armor. Thus, his identity as a war god is still apparent. Later he became more closely associated with food and good fortune. This tendency was reinforced by his identification with the Shinto deity Ookuninushi no Mikoto 大国主命. The sculpture of Saidaiji 西大寺 in Nara (13c), which still displays a severe countenance and does not include the tawara was made by Zenshun 善春 on the order of Eison 叡尊 (1201-90) after he had a vision of Makakara. Of the many later sculptures, those of Shoujuraigouji 聖衆来迎寺 (1339) in Shiga prefecture by Suruga Ajari 駿河阿闍利; of Hokkeji 法華寺 (1319) in Nara; and that of Kojimadera 子島寺(1609) in Nara; are among those that are notable.